Don't judge Halloween desserts by their size. This chocolate-covered cherry recipe may quickly become your family's favorite Halloween treat. With melted chocolate, Hershey's Kisses, sliced almonds and a little bit of red icing, maraschino cherries become tasty mice nearly too cute to eat! 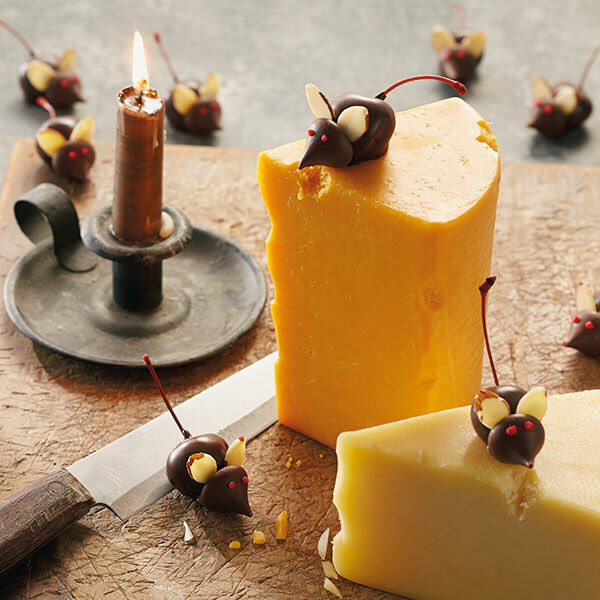 The stems of maraschino cherries make the perfect tail for your cute little critters. Melt and blend semisweet chocolate, butter and paraffin in microwave on low until smooth. About every 20 seconds, stop the microwave and stir your mixture to avoid burning it. Using the stem as a handle, dip a dry maraschino cherry into the melted chocolate mixture and completely cover the cherry, leaving the stem free. Place the cherry on a cookie sheet lined with wax paper. While chocolate is still soft, press the bottom of an unwrapped chocolate kiss to the bottom of the dipped cherry (opposite the stem) to form a head. Wedge 2 almond slices between the cherry and the chocolate kiss to make the ears. Repeat with remaining cherries. If the chocolate mixture starts to harden, just pop it back in the microwave for a few seconds until it softens again. Let mice cool. Use red icing to add 2 dots to your mouse faces for the eyes. Serve on a plate lined with wax paper to prevent them from sticking. Tip: Make sure the cherries are really, really dry before dipping or the chocolate won’t stick to them.